Writing copy is hard, isn’t it? You’re staring at a blank sheet. You try to conjure up your headline. But the words won’t come. Trying to summon your muse? Good writing isn’t about inspiration. When you know how to prepare and plan your copy, writing becomes a breeze. And you never need to stare at a blank sheet again. You never run out of inspiration again. A good copywriting process starts with creating an inventory of persuasive arguments. Because once you’ve decided what you need to write, composing your paragraphs and sentences becomes easier. A lot easier. Check out the presentation below and learn the 5 questions you must answer to find your persuasive arguments. Great tips and like the format. Kind of hard to work on phone but has more impact. Yes, I appreciate the swiping is a little irritating. On desktop, the clicking for each slide isn’t great for RSI-sufferers either. I guess each format has upsides and downsides! I found this quite interesting and helpful. It resonated well with me, because more often than not, it is tempting to jump in front on the blank space, believing that inspiration will come. While that might work sometimes, a lack of preparation will harm the copy. Those bullet points will easily become sentences rather than depending solely on wit and creative impulse. Thank you once again! Great summary! To me, the most important point is the “Why should I care”. When a company answers that for me, I’m likely to buy it. Otherwise they have no chances. I’m sure you have watched this TED talk, but if not, I highly recommend it. Yep, I agree – it’s the most important point, and still quite often overlooked. I’ve also read Simon Sinek’s book about the why, but felt it didn’t add much to his TED talk. His TED talk is great. Very helpful! To answer your question in the email I received, yes, you should definitely create more slideshows with illustrations! I cannot think of myself as a copywriter. I am now learning the basics, although I have no idea where to find my first clients in the future. Maybe you can give us some tips on that if you haven’t already (and I missed them). I really admire you! I also tweeted you some questions about blogging, and I thank you for your help! Thank you so much, Emilia! However, it’s probably easier and quicker to find a client via friends or acquaintances. I’ve also heard from many copywriters that they find clients on LinkedIn. I’ve never been very active on LinkedIn, but still picked up a few inquiries there, too. Useful tips, Henneke. But please remove the “to” from “What action should your reader to take?” in slide 10 for the sake of our sanity. Very nicely noted. Sometimes our eyes become so accustomed to reading what we should that we ignore reading what it is! Oops. I’ve corrected it straightaway. Thank you for spotting that, Eliza! Mind blowing SlideShare. I must say that telling the readers how the product is going to help them is very essential since they are not interested in the goodness of the product but rather with what’s in it for them! And I loved your SlideShare! I always wanted to ask you, how do you create those images? They are different for each post so it must be time taking right? I draw the images by hand with pencil, then with ink and colored pencils. It takes about half an hour to draw a simple image, and then some more time for scanning, a little retouching and adding the headline and border. I’ve recently been re-using images either from blog posts or from the video tutorials I’ve illustrated for my writing courses. In this case, all images were re-used. Wow! I don’t believe it! I thought you had a designer to draw every image! And was wondering the cost? How come all the images look so similar I mean if I draw two elephants they may look like brothers but not like the same one and your images all look like the same girl with different expressions! It’s relatively easy to make the girl recognizable as her features are quite exaggerated – especially her big nose, but also her eyes; and she always wears the same dress and scarf, so that helps, too. The shapes are all quite easy to draw (large circle for her head, triangle for her nose, stick-figure legs & arms, etc), making it relatively easy to keep consistency (although her head has become a lot bigger over time! 😉 ). This all seems so easy but i know it should be taking some efforts. Till now I thought only cartoonists did this sort of consistent thing. Great tips. Look forward to more of same. Need all the help I can get. Insanely simple breakdown of what can often feel VERY overwhelming. And great idea about the checklist! I see an infographic in our future. ? Yes, why not. And infographics are also more mobile-friendly! Hi Henneke! A treasure trove of writing gems, as always! I love the premise that inspiration is the result of preparation, not some mysterious muse. As feedback on the format, a very fun way to look at the information, but a bit more work to go through. I would agree with an earlier comment that it’s not as mobile friendly. Thank you so much, Kathy – and I appreciate the feedback on the format. I won’t create these all the time and perhaps keep them relatively short, so they’re not too much effort for mobile users (1 in 5 of my web visitors uses mobile!). Love your illustrations and slideshow. Your step-by-step system is a helpful reminder of how to do copywriting. And yes, try to “bully” your clients into following your process. 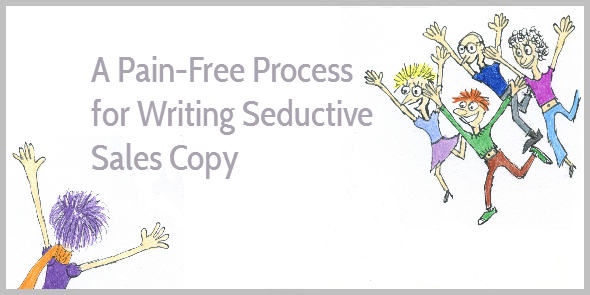 Whenever clients tried to interfere with my process, writing good copy became a nightmare. I found the 5 questions were equally treated with the well thought images. Please enchant us with your cute images. Yes, this process works for any web page. The only thing to be aware of with home pages is that often you have multiple calls to action as the home page acts like a sign post sending different types of visitors into different directions on your site. Thank you for stopping by again, Jon! Great tips on writing copy with your emotions. I really liked the part where you said include what is important such as an argument. Copy writing is a skill that I need to practice. Thank you for all your tips and knowledge. Great post, Henneke. I agree figuring out what to write is half the battle, maybe more. Some posts come so easy and others are like assembling a cabinet with tweezers. Thank you for these tips. Yep, figuring out what goes on a web page is often more than half the battle for me! Sometimes, it seems I’ve misplaced the instructions, and nothing seems to fit. But when I keep trying, there’s always a solution. Very simple, but very good advice. If you can tick off all those fundamentals in your writing, you’re on to a winner. And I loved Jon P’s suggestion that these five points apply just as well to a home page on a website. Or even an About page. Love your cartoons, as ever. Yep, so true … as long as you can find the right answers to the questions, you’re on to a winner! Thank you for your lovely comment, Mel. Always good to “see” you! Henneke! I loved the pic of the brain surgery! I laughed and laughed! Great job! I also like slide shows a lot, but I think they take more data and I have to be careful about running low. Yes, that might be true – about the data. I hadn’t thought about it. The one that I often see abused is focus on a single CTA. That’s often a problem for business owners writing their own copy, not so much with professionals. It’s important. Too many choices, any choice, is apt to confuse the visitor. If you don’t know where to send them, then maybe you need a better understanding of who they are. One more thing – you might not want to peer too deeply into my unfulfilled desires. ? A good 5 step process to plan your copy. I love the Slideshare format Henneke. It’s visual, snackable and easy to digest. The SlideShares are fun too create, too! Thank you, Mark. I appreciate your comment (and all your sharing!). The point about why they might hesitate and answering all of those questions so they have no reason to is so key. Doing that means you truly know their pain points and what their doubts may be with taking action. So answering those doubts at all costs BEFORE they can have it is the best way to go. And that takes research and preparation. Yep, that’s true. It takes time to research, but I think it’s worth it; and over time, you can do less research as you get to know your audience better. Thank you for your kind words, Andrew! This is spot on Henneke. I am a member of American Writers and Artists Inc. headquartered in Delray beach, Fla. USA. their flagship course is 6 figure copywriting. It is centered around Michael Masterson’s Architecture of Persuasion which you seem to have knowledge of in your post. Thank you, Michael. I don’t know Michael Masterson’s Architecture of Persuasion, but I have heard of AWAI! Special thanks for this one, Henneke, I loved the illustrations! I’m so inspired when I see authentic and consistent brands like yours, thank you for being an inspiration. Also, i think you’re making the best point ever when saying that the key to good copywriting is preparation. Writing is just 15% of the process….Listening is the base of success 🙂 Loved it, happy weekend! What a lovely comment. Thank you, Antoniya. And yes, I agree with you – putting the words on paper is only a very small part of the writing process! I hope you’re enjoying your weekend, too. Great post. The only time I’ve ever had writers block on a copywriting project is when I was working at an agency and a job would come to me with little to no brief. How to sneak into the mind of the buyer or reader to understand their pain points? Related Forum discussion, an overview of comments are some ways.What is your personal approach? You draw the picture by imagination (while hunting for pain points) or collects from other sources. For my own business, I’ve used a mix of tools to understand my readers. In the beginning, I Skyped with a few readers. Often in-depth interviews are more useful that superficial surveys. I’ve also asked questions by email. I continue to learn more about how I can help readers. Now, mainly from blog comments and forum discussions (for my paid courses). As always, great copywriting tips. The preparation phase of writing is the most crucial that non-practitioners of the copywriting craft often tend to skip and start writing a draft. It’s akin to starting your engine and starting to drive without even having a clear idea about your destination so you can map out the best route one should take. I’m particularly taking to heart “write with your ears”. Listening to your audience is the key to coming up with blog post ideas and focusing your writing on answering the burning questions from your potential readers. Yes, I agree—many underestimate the importance of a good preparation. I like to see copywriting as assembling rather than writing from scratch. You “steal” the words from customers, repeating back their problems and wishes. Thank you for stopping by, Alex. I appreciate it. I love your articles but I can’t seem to open any of the slide presentations. Nothing happens when I click the arrow or the slide. And right clicking doesn’t offer the option to open any links. I also don’t see that anything is blocked on my end. I could definitely use a pain-free process for writing sales copy.